The Highfive hardware and service are designed to require no additional configuration steps for a great experience. If you’ve met the the Network and Device Requirements for Highfive and are experiencing degraded Highfive call quality, the following steps may help find and eliminate the source of the problem. Important: Please consult with your IT team or network administrator before making any changes to the network settings to ensure you are not violating any organizational or regulatory policies. The minimum-supported connection speed is 100 Mbps. It is unlikely that video conferencing will function effectively on 10 Mbps network connections. We also recommend enabling flow control for 100 Mbps connections. As of June 2018, Highfive supports the DSCP tag AF41 for all video, audio and STUN traffic on the LAN. The packets are always tagged with AF41, and enabling QoS support for computers running OS X, Linux, ChromeOS, and for Windows configurations where the client machines are part of a domain, will work as soon as the configuration is complete. For a simplified setup, consider assigning your Highfive equipment to a dedicated VLAN, and have that VLAN configured with unrestricted access to external services and other devices on the same VLAN. Highfive does not require that local users be able to directly access our devices: All meeting-related transmissions are directly with the meeting servers. 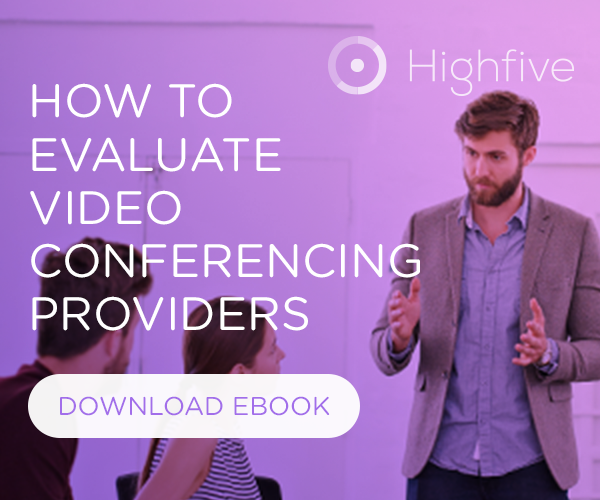 Having Highfive on a dedicated VLAN means you can keep your existing network configuration and security rules without negatively affecting the network traffic throughput that comes with using a realtime video conferencing service like Highfive. Apply the following network recommendations can help to eliminate problems with realtime video conferencing traffic. Routing Priorities. Wherever possible, set the routing priority for Highfive traffic to "realtime" in your network. Traffic-shaping and bandwidth-shaping rules. Set Highfive traffic at the highest available priority to ensure it gets routed most efficiently. Deep-packet inspection rules and devices (DPI). Exclude Highfive traffic from passing through the any DPI process to help ensure a smooth link between client devices and the meeting servers. DPI devices can interrupt realtime traffic flow in a way that leads to higher latency, data bursts, and more retransmission. Application Layer Firewalls. If Highfive traffic is being monitored by an application layer firewall, this can harm the realtime traffic needs of video conferencing by adding lag, causing packet timeouts, and contributing to jitter.